All School of Arts research students are warmly invited to the Christmas PGR Research Collective taking place this Wednesday at 7pm. The Collective gives PGR students across the school a friendly space in which to practice, present, explore and question your work in progress. There will be mince pies! Looking for a place to discuss your research? Join our informal researchers’ forum, run by research students. Meeting monthly, the Collective gives PGR students across the school a friendly space in which to practice, present, explore and question your work in progress. 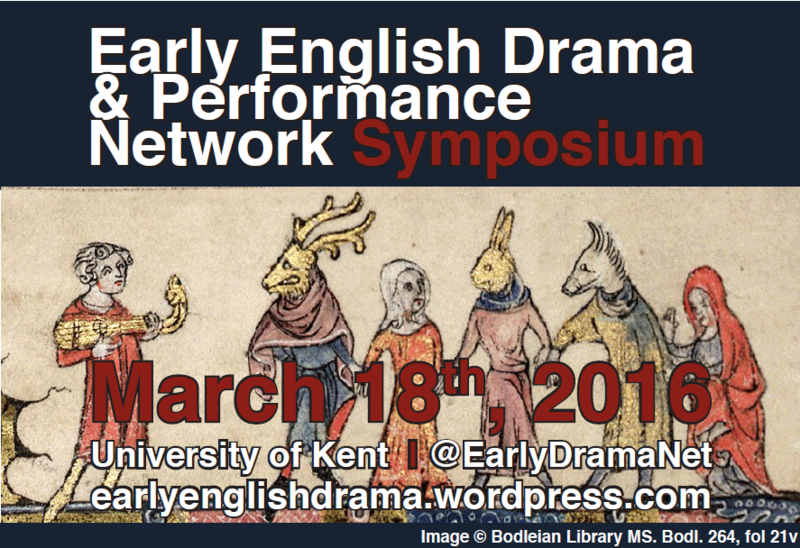 The Early English Drama & Performance Network will be hosting their first Postgraduate and Early-Career Symposium on Friday, March 18th, 2016 at the University of Kent. The Symposium will comprise of a series of talks and workshops that cover topics tailored to doctoral and early-career researchers in early drama (medieval and early modern). Session topics will include, for example, practice-based research, tips for producing successful funding applications, avenues for publishing, techniques for teaching early drama, and using medieval and early modern archives. Scholars, researchers, and professionals who have successfully researched, produced, and taught early drama will lead the sessions. The symposium will conclude with an open space session that will allow the participants to continue to discuss the day’s topics and to raise any further issues relevant to the field and its future directions. Confirmed speakers: Mark Chambers (Durham University and REED NE Project), Elisabeth Dutton (University of Fribourg and EDOX), Martin Gibbons (Pantaloons), James Gibson (REED Kent Project), James McBain (University of Fribourg and EDOX), John McGavin (University of Southampton), Catherine Richardson (University of Kent), and Meg Twycross (Lancaster University). The registration deadline is Monday, February 1st, 2016 and can be completed via the form on the EED&PN Blog at https://earlyenglishdrama.wordpress.com. A full programme will be posted to the blog soon. Questions should be directed to Tamara Haddad (t.n.haddad@kent.ac.uk) or Francisca Stangel (f.l.stangel@kent.ac.uk). Delegates are also encouraged to attend the Medieval English Theatre Meeting on ‘Transnational Drama’ that will take place the following day (Saturday, March 19th, 2016) at the University of Kent. Registration details for the METh Meeting will be posted soon to http://www.medievalenglishtheatre.co.uk/index.html. On Wednesday 9th December 2015 Prof Neil Kenny (All Souls, Oxford University) will be delivering the term’s guest lecture. His topic will be ‘Renaissance and Social Hierarchy: Family Transmission.’ Research Students are welcome to join the MA students for what promises to be a terrific talk. The lecture will take place at 6pm in room B02 in 43 Gordon Square. Prof. Kenny will also be running a seminar in the 7.40 slot. Again, you are very welcome to join in, but please be aware that if you want to join the seminar session too, you will have to prepare a short presentation in advance. Do contact Dr Gillian Woods (g.woods@bbk.ac.uk) know if you are interested in taking part in the seminar so that she can send you the relevant materials.